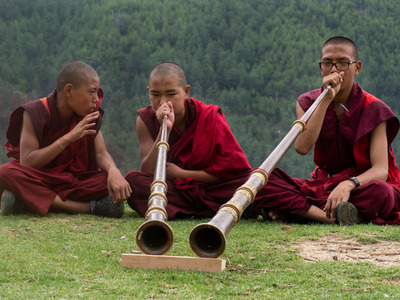 Paula Bronstein/Getty Images for LumixTeenage monks practice playing prayer flutes at the Dechen Phodrang monastery on June 14, 2018, in Thimphu, Bhutan. Although Bhutan is sometimes thought of as the happiest nation in the world, modern problems are hurting its reputation. Technology and outside influences are slowly changing the traditional way of life in Bhutan. For years, the small Asian nation of Bhutan has defined success not through its economy, but through happiness. But Bhutanese people are discovering that perception doesn’t always equal reality. Despite the government’s efforts, Bhutan ranked just 97th out of 156 countries in the most recent edition of the United Nations’ World Happiness Report list. Part of the reason may have to do with technology. Although Bhutan resisted it for decades, modern advances like cell phones, TV, and computers are slowly starting to take hold there, bringing with them unfamiliar problems and causing old ways of life to disappear. In recent years, TV has been blamed for everything from Bhutan’s rising crime rate to its shifting demographics as rural residents head for bigger towns in search of work. “We have an increasing income gap, we have increasing youth unemployment, environmental degradation,” Needrup Zangpo, executive director of the Journalists’ Association of Bhutan, told NPR. Statistics from Bhutan’s own happiness survey illustrate the transformation: According to the most recent Gross National Happiness report from 2015, the number of people reporting negative emotions such as anger, fear, and selfishness increased from the previous survey, while positive emotions like compassion and forgiveness had decreased. As progress marches on, Bhutan is going to have to learn to adapt to modern challenges – and the shifting mood of its people.